Yes, I’m going to GUADEC this year, I’m very happy about it and I hope to see a lot of friends there, ok I’ve seen a couple of them during the last Ubuntu Developer Summit at Prague but it’s always great to get together more often to talk, discuss and have a lot of fun, see you guys there!. Our first meeting is scheduled for 29 May 0000 UTC at #ubuntu-meeting on irc.freenode.net, there’s more information about it on the Fridge and of course on our wiki page. if you haven’t applied for a membership this is probably the right time for do it. La Garza Robusta ha llegado! The new release of Ubuntu the Hardy Heron is released, to see what’s new you may want to take a look to the desktop tour, enjoy! What are you waiting for download it? Claudio I’ve received the same SPAM from GNUCHILE a couple of days ago, mail in question is available here , if you look to the link at the bottom of it there’s something like “Si desea bloquear su correo para no recibir avisos de ningun tipo, haga click aqui” (If you want to block your email address in order to not receive any news, click here), I was looking to the page and there’s no way to “unsubscribe” your email from that “list” and well i didn’t even subscribe to it in the first place. I have to say that I’m really really disappointed on how the GNUCHILE guys are working, they don’t seem to understand anything. Anyways, can you please stop doing this kind of things? And please unsubscribe me of the cute list of emails to be spammed, kthxbye. Update: Oscar Valenzuela (Director of GNUCHILE) blogged about it here. They still don’t get it. Posted on March 12, 2008 Categories General2 Comments on GNOME 2.22 is out! If you read Planet Ubuntu you’ll see a few posts about “5”, the 5 a day initiative it’s a really way to start contributing to Ubuntu and the Free Software in general and I’ve always had the impression that some of GNOME related packages (ie: Anjuta, Banshee, Beagle, etc) at Universe aren’t getting a lot of their bugs triaged, that’s why since a few day ago I’ve started to do “5 a day” on them and I hope to have them in a good state in the short term. By the way as commented on my previous post I’ll be around Lima at the end of next week and it seems to be the perfect time to start doing some 5 with the local people, if you’re interested on it just come by the conference place and let’s do some 5 together!. Posted on February 26, 2008 February 26, 2008 Categories General3 Comments on Get Involved! The February 14 th is a very important day for all the lovers and it’s perfect to show how much you love Ubuntu. So do you want a way to express it? Perfect!, the Thursday 14th will be celebrating another Ubuntu Hug Day, this time based on Compiz, you can join us at #ubuntu-bugs (irc.freenode.net) during the whole day in all timezones, more info about it here. 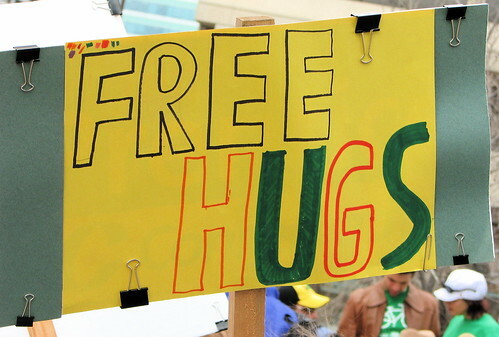 Posted on February 12, 2008 February 12, 2008 Categories General2 Comments on Free Hugs! Any Takers?